Frank Wilson accepts commissions to custom create fine art paintings for collectors as well as canvas and hardboard murals and illusions for residences, offices, hotels, spas and businesses. See the "How to Hire Me" page. It would give me great pleasure to create a custom painting or canvas mural for your home or office. If at all possible, you are first encouraged to visit my studio/gallery in Paradise, California to see the scope and quality of my work to ascertain if it is suitable for your project. At my studio, I will work with you, getting your ideas on subject matter and what color schemes you have in mind or I can propose. I may also make helpful suggestions as to what may be appropriate for your home or office. Rough estimates and budgets for the project are discussed at this point. If you wish to proceed, I then visit your home or office to see the wall(s), take measurements and draw some rough sketches for you. If you approve the rough sketches I then work up a small, comprehensive, full color study done to scale. In this way you can see what your painting or canvas mural will look like with no surprises. There is a modest charge for these design services. I will do up to one revision on the full color study at no additional cost. There is a charge for subsequent revisions. When you approve the full color study, a final price is agreed upon based on the scope of the work to be done and an "Agreement To Create Artwork" is written up, detailing the scope of the work along with timetables and cost of the project. The "Agreement To Create Artwork" is then signed and dated by both me and you. One half of the final cost is due when the art work begins with the balance due at the completion of the project. I use only the highest grade materials in my art so your painting or mural on canvas or hardboard will last generations. References are available upon request. For large painting or mural commissions that have to be shipped, I use Genie Canvas, a quality, collapsible stretched canvas system that ships very economically in a mailing tube and requires NO tools to assemble. Assembly time is less than 5 minutes. I also accept some rather unusual work such as transforming the solid steel door of a gun safe into a work of art. This piece is about 60" in height. The safe door was previously enameled a light tan color. 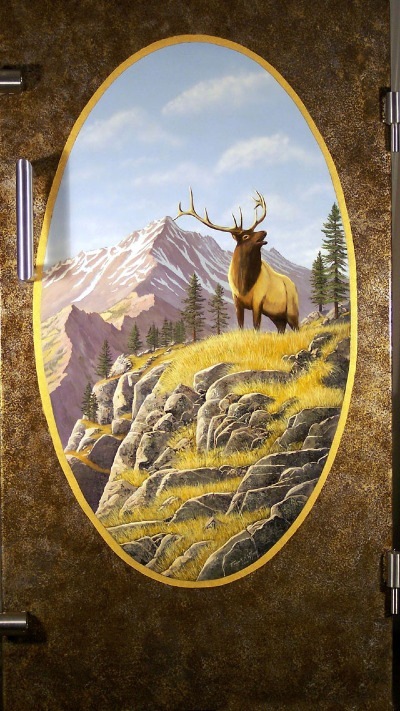 My client wanted an antique oval motif with an elk in it. I came up with several proposals and my client settled on this design. It is late fall and the elk bellows from the high Sierra Nevada Mountains where the winter snows will soon drive him down to lower elevations. I created the illusion of a hammered metal finish by applying several tones of gold, silvers and earth colors to create a faux finish that resembles old, rough surfaced metal. What do you have that you would like transformed with paint into a one of a kind, family heirloom? I can paint any door, furniture or other surface that you would like painted into a very personal statement! Or consider a custom designed mural that brings out the color scheme of your room! I accept Mastercard, Visa, American Express, Discover and Bank Cards in payment for original art, prints, canvas and hardboard murals and illusions. Click on the "Buy Now" button to enter your payment information. You are invited to leave comments on individual paintings Pick your favorite!